Doggone it — that Obama team has a yen for man's best friend. First, the president-elect promised his kids a dog. Then Vice President-elect Joe Biden bought a purebred puppy from a kennel last week. Now the incoming veep says he's getting a second puppy — this time from a pound. Many people have been pondering the pending pitter-patter of puppy feet in the White House and the vice president's residence come January. The Bidens beat the Obamas to the puppy punch with their adorable three-month-old German shepherd. But some poo-pooed the Bidens' choice of a puppy from a breeder rather than one adopted from a shelter. Now the vice president-elect tells ABC's This Week another cutie is on the way. "We're gonna get a pound dog that my wife wants," Biden said. Biden told ABC the new puppy will likely be a golden retriever — and that he's not adopting from a pound just to be politically correct. "We've always had two dogs," he says. "We've always had two big dogs so they can have companionship. I've had German shepherds from the time I was a kid. I've trained them and shown them." Biden also told ABC his family is no stranger to pound pets. "We already have a pound cat — we've had pound animals in our house," he says. Former Price Is Right host and animal activist Bob Barker and others have criticized the Bidens for buying from a breeder, citing cruel conditions at so-called puppy mills. And the economy is hurting shelters across the country. Many are reporting a drop-off in donations and government funding as well as a shrinking pool of people who want to adopt. President-elect Obama has said he'd prefer a pound pup, but his daughter's allergies might make that impossible. 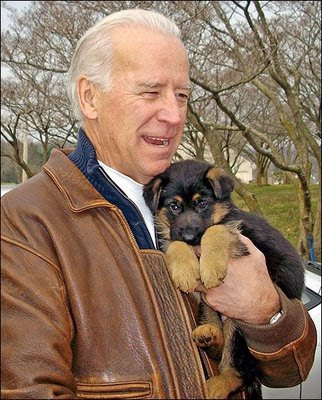 As for the Bidens, what is the new puppy's name? "My granddaughters are gonna make that clear on Christmas morning," Biden says.